Ed. Note: The data in this post is drawn primarily from Dasient's proprietary malware analysis platform, which gathers data on web-based malware attacks from across the web and in the last six months has been used to help tens of thousands of site owners address their web-based malware issues. This is the first in a series of regular reports on these trends. As we've discussed in this space before, we are seeing a fundamental shift in how malware is being distributed: Attackers are focusing more than ever on compromising legitimate websites and using them to distribute malware. As a result, more and more sites are feeling the effects of web-based malware infection, which can include loss of traffic, decline in revenue, and damage to brand equity. This trend is underlined by the data we've gathered on the third quarter of 2009, which saw significant activity on the web-based malware front. During that span, Dasient identified more than 52,000 web-based malware infections, making for a total of more than 72,000 unique malware infections identified and catalogued since our malware analysis platform launched. Based on the telemetry data we've gathered from the web, we estimate that more than 640,000 sites and approximately 5.8 million pages were infected in the quarter. This is a substantial increase from data published by Microsoft in April 2009, which pegged the number of infected pages per quarter at a little more than 3 million. This increased activity is also reflected in the rapid growth of the blacklists maintained by search engines, browsers, and anti-virus software companies. The Google blacklist alone has more than doubled in the last year, and at certain points has been adding 40,000 new sites per week. This shift has been accelerated by the fact that using legitimate sites as a delivery method enables attackers to infect large numbers of endpoints at once, and by the trend toward increasing complexity in and interoperability between websites and web applications (which is in turn opening up more and more attack surfaces). While it often takes only a couple of infected pages to harm users or land a site on one of the many blacklists, our research suggests that when sites are infected, the bad code is installed on a significant portion of the pages on those sites. 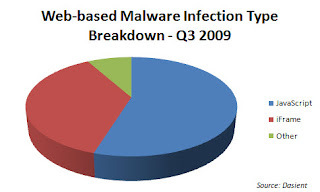 In Q3'09, the infections on newly compromised sites of 10 pages or more spread to an average of 19% of those sites' pages. This number is significant for a couple of reasons. For one, the greater the percentage of a site that's infected, the greater the chances are that the site will spread malware to users or be flagged by a blacklist provider. For another, modern web-based malware infections are frequently complex and heavily obfuscated, making it a challenge even for experienced webmasters to identify all the bad code on the site and remove it. The more infected pages there are on the site, the longer it can take to address the infection. And if the site has already been blacklisted (which is often the case), then the site will take a hit in traffic, reputation, and revenue with each day that passes during the cleanup and blacklist appeal process. Another trend worth noting from Q3 is the high reinfection rate for sites, which came in at 39.6%. There are a number of factors that could contribute to a high reinfection rate, including the tendency for attackers to look for attack vectors common to large numbers of sites and then develop automated attack scripts that will repeatedly seek out those vectors and exploit them. The sheer number of available attack vectors likely also plays a part. Common attack vectors include compromised FTP credentials, server-side vulnerabilities, unpatched or unknown web application vulnerabilities, and syndicated ad networks serving malicious ads. With attackers embracing scale and automation, and with so many ways for even well-secured sites to be compromised, it's becoming more and more important for site owners to employ tools that can help them regularly monitor their sites for infection and quickly address any issues that arise. One of the challenging things about trying to protect sites from the threat of web-based malware is that the attacks often evolve very quickly and make use of a number of obfuscation techniques to evade traditional malware scanners. We saw plenty of this activity in Q3, with some notable recent examples being dynamically generating the SRC attribute in iFrames to foil scanners that look at SRC attributes; using partially or fully encoded URLs to frustrate scanners that look for regular expressions; and adding phrases like "analytics-google" to malicious code to fool webmasters into thinking the code is legitimate. The Dasient Web-Anti Malware (WAM) service regularly monitors our customers' sites for signs of a web-based malware infection. When an infection is detected, it notifies the customer immediately, providing full diagnostic information on the infection. It can also automatically strip out the bad code from infected pages before they're served to the site's users -- keeping those users safe and keeping the site off the blacklist. We're proud to be able to provide this service to our customers, and have received great feedback since launching earlier this year. But as the threat of web-based malware continues to grow, one of the things we're hearing from the web, security, and IT professionals we work with is that they need more information to help them keep track of the threat and ensure that they have the tools they need to address it. With that in mind, we will now start providing these professionals with a view into the Dasient Infection Library, which in just a few months has accumulated data on more than 70,000 different web-based malware infections. To start, we'll be providing information on the top 10 web-based malware attacks for the week, as well as some other basic trend information on the latest attacks. We'll also be publishing relatively new infections that our platform finds to a dedicated Twitter feed. We hope to expand the view we offer into our Infection Library in the future, and are looking forward to your feedback on the kinds of data and functionality you'd find useful. If you're a business owner and you'd like to learn more about how Dasient WAM can help protect your business, head here. If you're a web hosting provider and you'd like to learn about partnership opportunities with Dasient, check out this page. And no matter who you are, please be sure to check out our Twitter feed at http://twitter.com/dasient for all the latest in web-based malware and general security news. The infection library would make a very useful Firefox plugin, wouldn't it? I know a ton of people that would use it profusely, and I bet it would drive a lot of traffic to your website. Excellent report, by the way. Thanks! Thanks for this wonderful post. I'm a health conscious guy and your article will be one of my new resource from now on. P.S I also have a blog about yeast infection and yeast infection remedies. If you want to learn more about the illness feel free to visit my site. I like this info and well discuss. This is a great inspiring. I am pretty much pleased with your good work. You put really very helpful information. Looking to reading your next post. những loại thuốc tây chữa bệnh viêm gan b cần biết , mổ trong bệnh viêm amidan cấp , khắc phụ tình trạng viêm amidan hốc mủ cực nhanh thuốc chữa bệnh đại tràng của người thái. khi bị đau dạ dày cần biết bị đau dạ dày cần ăn gì cho thật tốt triệu chứng đau dạ dày như thế nào cách chữa viêm họng bằng nước muối bệnh viêm amidan ở trẻ em Hoặc sau khi mổ amidan cần kiêng gì sau cắt viêm amidan . Superb. Thanks for writing that. Thankyou so much for the post! the infection of this malicious software is very bad. thank you for sharing. When you're the former accessories design director for Marc Jacobs, it's easy to get noticed when you launch your own handbag coach factory store line. But Joy Gryson's Gryson line is deserving of the attention. The bag designer launched her label when she realized that even coach purses she couldn't afford all of the handbags she lusted after, and the prices reflect that. Given, Gryson bags aren't exactly cheap, but michael kors bags they are more affordable than, say, a Miu Miu Matelesse Napa Shoulder Bag. Gryson's sturdy, versatile bags are characterized by braided leather Coach Outlet Store Online handles, brushed-metal hardware, and unexpected colors like cranberry and olive green. Here's a look at some highlights from her collection. You'll share your top blog.logdown.com/ ratings and show good gamer associated Here with a game Nothing is going to be made up to Game Killer | Free Download Game Killer APK App For Android make use of it to buy anything inside Game Killer Download your game You've got no intend to Game Killer make use of genuine cash money. quickly and conserves our time.It is simple to use and download http://appvnapkdownload.com your gadget. Download appvn apk from right here. If a brand-new barrier xtgem.com/ is introduced, the RPS adds its location Title to the existing map. Since several charging cycles could be Best Essential Oil Diffusers for a Large Room! Pros, Cons and Recipes needed to complete a cleansing. The exact opposite thing anybody needs, borrower or moneylender, is to include the security to reimburse the advance. the Windows platform. Live Net TV APK Yet worry not, due to the fact that Get Info we have a method around that and also Live NetTV for Android you will definitely be able to utilize the app. العاب فلاش تعرف نجاحا كبيرا في جميع انحاء العالم ومؤخرا عرف العالم العربي انتشار الالعاب بشكل كبير واصبح الجميع يهتم بها لانها جد ممتعة وهدا ما جعل المواقع تكتر بسرعة البرق وهناك عدة انواع منها هناك من هي للاولاد وهناك من هي للبنات وهناك ايضا اصناف يمكن للجميع لعبها متل العاب طبخ متلا وبالنسبة للاولاد لديهم العاب سيارات و العاب اكشن و العاب سباق و العاب اطفال والمغامرات والكتير الكتير والبنات ايضا عندهم العاب تلبيس زد على ذلك العاب مكياج و قص الشعر وعدة انواع اخرى وكانت هذه مجرد فكرة بسيطة عن العاب فلاش ويمكنك انتم ايضا تجربتها اليوم ولعبها والاستمتاع بها يوميا في موقعنا الجميل والجديد الدي يعتبر من افضل مواقع al3ab-banat01 في العالم العربي ونتمنى ان تقضو معنا اوقاتا جد ممتعة مع تحياتنا . nhân sâm hàn quốc là một trong những nhan sam han quoc chinh hang loại thảo dược tự nhiên sâm hàn quốc, có mặt ở rất nhiều nhân sâm hàn quốc chính hãng quốc gia trên thế giới như Nhật Bản đại lý nhân sâm hàn quốc, Hàn quốc đại lý nhân sâm, Hoa Kì... Trong các loại nhân sâm nhân sâm hàn quốc chính hãng kể trên thì nhân sâm hàn quốc nhân sâm chính hãng luôn được hàng triệu người trên khắp đại lý nhân sâm hàn quốc thế giới săn lùng và tìm kiếm bởi những giá trị tuyệt vời sâm hàn quốc. Từ xưa đên nay những nhan sam han quoc công dụng của loại nhân sâm hàn quốc chính hãng nhân sâm này vẫn được nhan sam han quoc chinh hang mọi người lưu truyền và ứng dụng vào trong đời sống sâm hàn quốc đặc biệt là chăm sóc sức khỏe của con người đại lý nhân sâm hàn quốc. Củ nhân sâm hàn quốc chính nhan sam han quoc là nhân sâm Hàn Quốc nhân sâm hàn quốc chính hãng ở dạng tươi chưa qua sơ chế thành các sản phẩm sâm hàn quốc. Củ nhân sâm Hàn Quốc có những vai trò đại lý nhân sâm và tác dụng vô cùng nhân sâm hàn quốc chính hãng to lớn đối với con người. osjuegos para obtener más información. Thank you for sharing. Glad to find the post.